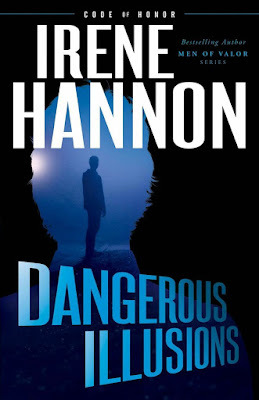 Dangerous Illusions is the first of a new series called “Code of Honor.” Irene Hannon is a favorite suspense author of mine, so this book has been near the top of my “most eagerly anticipated” books for quite some time. After giving the last book of the previous series, Tangled Webs, an easy five stars, I just knew this would be another great ride of a suspense thriller. While they were enjoyable, I didn’t feel like either Trish, Colin, or the bad guy reached a full three-dimensional characterization. Trish is a grief-stricken artist who falls hard for Colin. Colin is a man with some regrets who falls hard for Trish and tries not to let that get in the way of the investigation. Bad Guy is a man of many names and identities who cares only about getting away with a nice wad of cash for himself. One of the weakest parts of the book is the plot. What was it supposed to be? Elements of horror at how bad the bad guy was? Steamy, clean romance with two people overcoming all sorts of obstacles and having to believe in each other to get through it? From the cover picture and the back cover blurb, it makes it seem like the investigation into Trish is the number one plot, but I didn’t find that to hold true. There is so much other stuff going on. And when I got to the ending, the twist there didn’t surprise me a bit. This is another fail for me. Colin is a good guy, but he “used a word he rarely used” several times through the story. Heroes aren’t supposed to swear, in my book, or at least to not feel like any occasion actually excuses a swear. Even though I appreciate that the word wasn’t spelled out, the context had me filling in possibilities anyway. Fast forward to the bad guy. He goes into a bar and ends up “picking up” a woman who makes herself available. Then it goes into a lengthy bit of detail about him taking her home to her place, them giving each other some drinks and some heavy innuendos, and them taking clothes off and climbing into bed to have some fun. While it didn’t become graphic, it strayed mighty near. This part of the book was, I felt, very well done. Trish’s faith seems authentic and important to her, in particular. There is talk of going to church, praying, and trusting God. Overall, Dangerous Illusions had a lot of promise, but with the distractions caused by the bad guy’s POV parts being so lengthy, and the romance taking up so much real estate in the plot line, I never ended up getting the edge-of-my-seat suspense thrill that I have come to expect with one of Hannon’s suspense stories. I would recommend it instead to readers of romance who like a bit of spice of danger and a bad dude trying to hurt the fair lady.